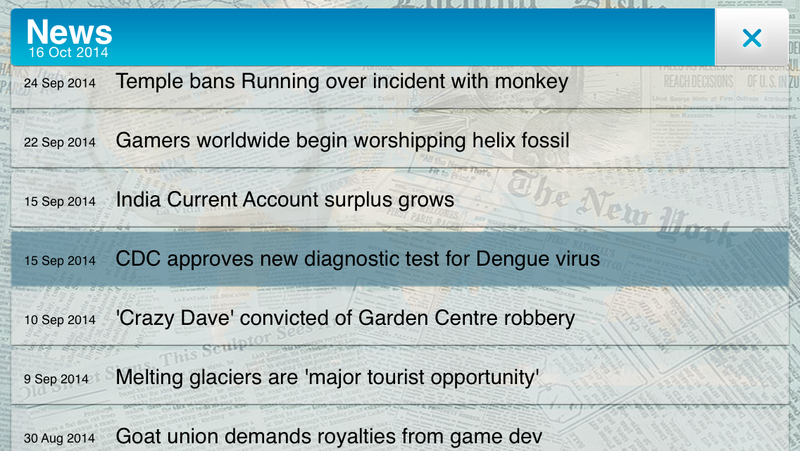 News Headline Competition #2 - Be Featured in Plague Inc. & Plague Inc: Evolved! We were so impressed with the quality of entries to our last news headline competition that it was only a matter of time before we did another one. Now you have another chance to write a news headline, and have it featured in Plague Inc. on mobile and PC, to be read by over 35 million people worldwide! In our last news headline competition there was a really colossal response, with almost 500 entries and a final six winners chosen to be in game. If you're looking for inspiration - good places to start are things happening in the news recently. Some of the best headlines are super current and reference things happening right now. The last batch of winners mentioned everything from Dr. Who to Virtual Reality and even Gangnam Style, so feel free to go crazy! Feel free to enter as many headlines as you want to - some of our winners last time had multiple entries. Post your proposed news articles in this thread – you’ve got until 7th December 2014, so get writing! P.S. - As before, there is a special prize for anyone who manages to make the front page of Reddit. No one managed it last time - will you be the first? RE: News Headline Competition #2 - Be Featured in Plague Inc. & Plague Inc: Evolved! Congressional Republicans in the US ban any mention of Global Warming in textbooks. Latest version of 'Call of Duty' video game to feature title character from Goat Simulator. Scientists reveal living proof of alien life from another planet, expose comedian Bill Maher. Pro players taking long break and planning vacation. explanation: a lot of pro players of counter-strike: global offensive were banned by VAC lately due to cheating (probably). Many people are having fun from this and they are saying that players are going to "VACation". Scientists say humans are now invulnerable. The oldest man on Earth died at the age of 154. Wonky hole discovered in fabric of space and time. Man finds a broken sonic screwdriver. The USA denies existence of dark matter. The US denies existence of police booth-like ship. US president reportedly disappeared in his TARDIS. Macrohard IT company reports enormous profits. Macrohard vs Pear. Who makes better PCs? Hungary starts taxing the Internet, where will this lead them? Hungarian protesters turn into vandals, the blame is on the local football fans. The EU declares the 20th of September as "Blame the Hungarians day". Remaints of Russian tradesman found on the border of Hungary and Austria. Hungary refuses to embargo Russia "to improve our Power supply" they said. The EU sues Hungary over current reforms. Hungary re-elects the same party with 2/3 majority twice. Fears mounting over strain of Equine Flu. "Call of Honour" condemned for "encouraging terrorism".